Without looking at the numbers it may be difficult to notice how much an unsealed dock door costs in a day to day operation. Whether it be direct costs from escaping Air or indirect costs from external elements like rodents, rain, dust, or bugs an unsealed door is a liability for both employee safety and your products. To seal your dock there are two types of seals, Dock Shelters or Dock Seals. While both wrap around the outside of the door, their primary function is different. For example, dock seals are designed to be compressed thereby creating an airtight seal between the trailer and dock, while the other style, dock shelters, are designed to be penetrated by the trailer. We'll go more into these differences further down, but first let's go over the variables we use to determine the seal dimensions and type. In the loading dock industry standard isn't a common principle, for this reason we always recommend a quick checkup on the dimensions we've listed below. In our experience, taking these elements into consideration proves critical to the life and function of your dock seal. To help you understand these measurements, or in selecting the seal that best fits your budget and operation, loading dock supply experts are on hand ready to support you. Give us a call at 1800-741-1258 or keep reading to learn more! • Gap between door and hinges allows air to transfer as the curtains slide to the outside. 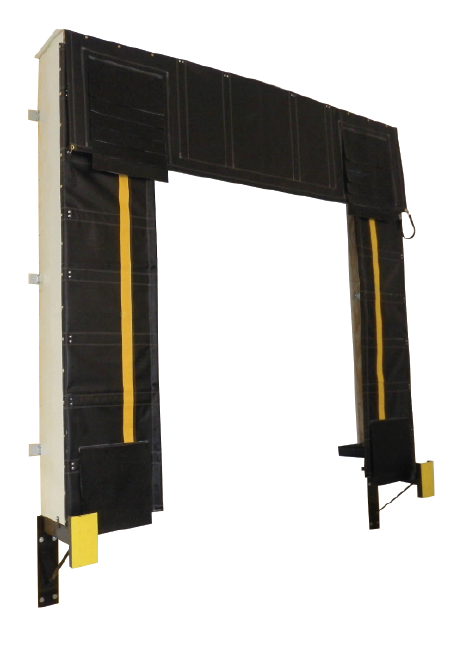 • Uses more space around the dock door; minimum width height is 11'6" wide by 11' High. • All hardware, frames, fiberglass panels, curtains, spring steel stays, and other miscellaneous components are available for individual sale. Pressure treated lumber frame covered with translucent fiberglass (top and side frames) to allow natural light into the dock area. Total of (18) 90° angle brackets to secure frame to wall. 24” overall projection is standard for 4 ½” bumper projection. (Frame will always extend 18" past dock bumper face). High tear vinyl pocket on inside edge of each vertical curtain contains pipe foam, which conforms to trailer for better seal. Sloped header prevents water collection on top. Over size wear pleats on bottom corners of vertical curtain face absorbs impact of lower trailer corners. High stength bungee straps prevent head curtain from blowing out of position. 6 overlapping high tear wear pleats in corners of header absorb impact of sharp trailer edges. Foam-filled draft pads inside lower corners prevent air from entering; “NO STEP” safety logo permanently affixed. Lag bolts set through copper grommets secures face and header curtains to shelter frame. Heavy-duty steel bumper guards support frame and provide protection from incoming vehicles. Spring steel stays inside of head curtain and side curtains ensure the curtains remain tight against sides of trailer. Pressure treated wood backer board. Optional steel channel backer available upon request. Total of (9) 90° angle brackets for outside edges of seals. Resilient industrial adhesive chemically bonds high density foam to wood backer; ensuring optimal performance and appearance. High Density foam for a longer life and superior compression. Two vent pockets on the outside of each seal vertical and on the underside of the header pad ensure compression for optimal release of air during compression. 3" Tapered bottom edge ensures the seal is not prematurely damaged by pinching between docked trucks and bumpers; Drainage holes punched in bottom to ensure release of moisture accumulation. 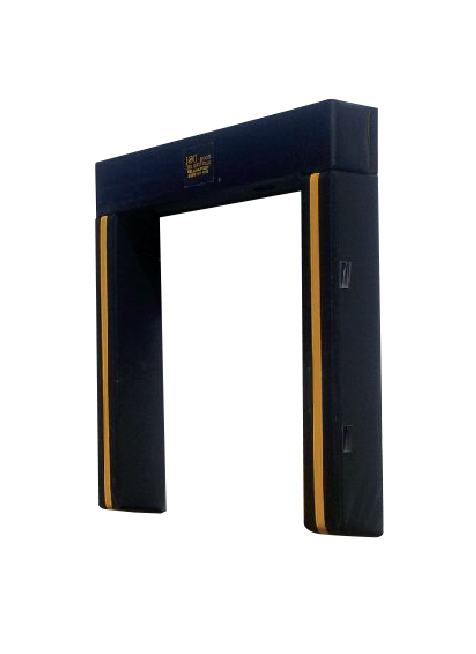 Standard seals are wedged to close openings down to an ideal 7'6" for use with standard 8' and 8'6" wide trailers, custom seals dimensions are available upon request. Several header heights and types are available to accomodate varying door heights and truck ranges. total of (9) Flat brackets for inside when mounted to edge of door; offset seals will use 90° angles for any offset edge great enough to accomodate angle. Yellow guide striped offset three inches from inside edges, ensuring trucks will accurately dock. Dock seal projection is based on the approach slope and projection of your dock bumpers. Dock shelters unlike foam pad dock seals are designed to slide along the sides of the trailer as it penetrates the shelter a minimum of 18". Slipping along the sides of the trailer or truck makes Dock Shelters capable of handling a wide range of freight widths and heights without limiting access to the door or trailer opening. 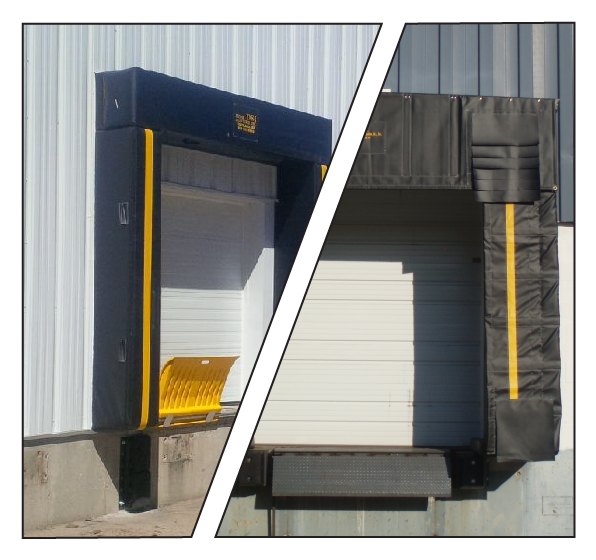 To acheive a complete seal around the sides of trailers foam filled dock seals are designed to close the door opening width down to 7'6" and the height down to at least 12'6" (Ground to bottom of seal). This is important as the typical width of dry van trailers and containers ranges from 8' to 8'6" wide and 12'6" - 13'6" high. In the majority of cases customers end up going with a dock seal due to it's superior sealing capabilities and lower initial price point. However, it is our opinion your final decision between a dock shelter and dock seal should be based on your needs. Do you need full access to the trailer width or height? Will there be a large variety of trailer sizes? Do you need a perfect seal? These among other questions are all going to invariably lead you to one option or the other. Our goal is to provide you with the best possible solution. It's this reason we keep staff on hand to help you identify solutions and conflicts with design and use of your seals.